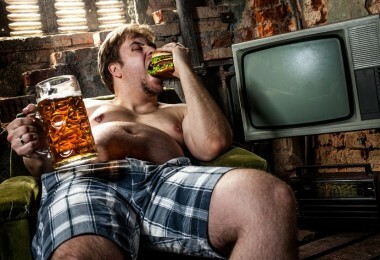 Home » Shyness and Social Anxiety » Do You Stay Inside Alone At Home All Day? Stay inside their home for days at a time unless they absolutely need to go out. Have stopped taking showers for the past few weeks and say they’re starting to look like a hermit. Haven’t gone out to socialize for months … or years. Spend hours a day watching TV or browsing the internet. Maybe you aren’t as bad as this, or maybe this describes you perfectly. In either case, this article will reveal how you can overcome the depression and low self esteem caused by staying inside a lot. The first thing to know is that beliefs cause feelings. Feelings like depression, insecurity and inferiority are caused by your thoughts and beliefs. I am not valuable. I am not good enough to be accepted as I am. I have no life. Other people always have more friends and exciting activities going on than me. I am ugly or have some physical flaw that makes me unattractive. It’s important for you to understand that you didn’t just wake up one day with these beliefs. They formed over time through real evidence you picked up through your daily experience. You don’t believe anything unless you have reasonable evidence or experiences to back it up. Your mind is constantly looking for evidence around you in order to determine your beliefs. Here’s a useful analogy: Think of a belief as a tabletop. The legs are the supporting evidence. 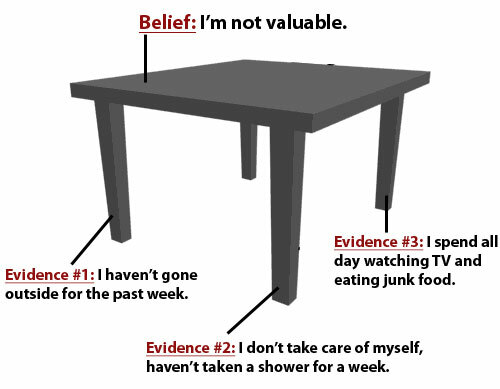 So lets look at how someone with social anxiety could form the belief “I’m not valuable.” This is what their table might look like. Do you see how, with the evidence provided, the belief “I’m not valuable” is actually a reasonable one to have? What does it mean to behave in a way that indicates you like yourself… that you value yourself? Well, you’re no different. When you value yourself, you will take actions to take care of yourself. This means being decently healthy, watching what you eat at least a little, eating more fruits and vegetables, cutting down on the junk food, exercising occasionally, going outside to enjoy nature, maintaining your personal hygiene, taking showers often, shaving, cutting your hair, brushing your teeth, taking care of your skin, etc. On the other hand, if you spend all week in your basement playing video games and eating junk food, then it’s going to be hard to suddenly feel great about yourself and have high self-esteem when you are around people. What you do for yourself is determined by how much you value yourself. This means taking steps to actively improve yourself. Getting out of your comfort zone regularly, being productive, learning new things, taking classes, travelling, and enriching your life. I honestly don’t know anyone who has high self-esteem who does not do most of these things. Whenever you do something that shows your mind you value yourself, you are giving it new evidence. This new evidence becomes a leg that reinforce the belief “I am valuable” in your mind. If you spend your day productively – you eat a healthy breakfast, hit the gym, learn something, accomplish something, and all the sudden you’re brain is bombarded with evidence that you’re WORTH something. Then you go out around people, and you feel less insecure. You feel a new level of confidence you didn’t have before, a calm, steady feeling of self esteem. You feel more entitled to express yourself and you stop holding other people in such high regard compared to you. And people will be able to tell that you feel good about yourself as a person. It’ll come across in your voice, eye contact and body language. When you’re living in alignment – with the way you treat yourself feeding into beliefs that make you feel good about yourself, the world can tell and responds accordingly. Ultimately, the way you feel about yourself is determined by the beliefs you hold about yourself and your value/worth. These beliefs are formed through the evidence you spend all day acquiring by observing your actions. Are you worth it? Are you behaving like it? If you think you can change your beliefs and deepest insecurities without changing your actions first, then you’re in for a life of sadness and depression. You have to first act in a way that builds up the beliefs you want to have about yourself. When you act as though you value yourself, you can’t help but to start feeling good about yourself. Hi my son is 22 he is very quiet unless you talk to him. he is not on drugs . he finsh college this year. he never go out with friends. he is in his room day and night on TV or computer. i don’t now what to do? do you have any idea? I have an idea. let him buy sean’s system it’s very helpful. I know this is an old article but it’s something I struggle with A LOT. This is probably my biggest stumbling block at trying to overcome social anxiety. See, I can talk and have conversations with people at work. When I do something and have something to talk about, I have no problem with conversations. But this problem here is my biggest struggle… It keeps me from developing actual strong friendships and forever keeps you feeling bad about yourself. I find I can do a lot of things… but I can’t maintain anything. Because IMO, nothing is worth doing, or interesting without someone to do it with. I may have something to talk about for a bit and I’ll start feeling good but this dries up so fast. And because I don’t like doing stuff alone, whatever it was I was doing, took A LOT of energy and work just to make it that far. And trying to maintain that level of activity by myself just never lasts. I honestly feel like a flame under a glass cup. This article talks about doing stuff that gives you self worth. Or makes your mind feel that you have worth. This doesn’t work for me because I get a sense of self worth when other people want to do stuff with me or I am having fun with somebody. I feel equal to them and I know they like me. Having a consistent friendship where we can just talk or do stuff, gives me self worth. There was nothing more I wanted to do than to skydive. But I never wanted to do it alone. So I never did it. I finally did just say screw it and balled it up and went out two hours to the skydive place and did my first jump. It took a LOT of work to do this and to keep my energy up feeling so awkward around everyone. Usually people go with friends so I already felt stupid. And these people are party animal type people. Which was hard to mesh with. But I kept at it. I had something to talk about at work and stuff. But finally I just gave up going. It just wasn’t any fun by myself. This is my problem with everything. I have to be doing something with someone or my interest burns up so fast because I find nothing is worth doing without a good friend to share it with. But since I can’t make friends to the level where we’d go do stuff, my life stays boring because I can’t keep the energy up to have such an active life and feel so empty. Chris, this article still applies to you mate, you don’t just suddenly magic a friend out of thin air. It takes work. You make friends doing these things that you don’t want to do because there’s no-one to do it with… and that builds the strongest friendships, having a strong common interest. Is pure cr*p, people arent going to just suddenly come up to you in the street and ask if you want to go sky diving. If no one wants to dive with you then go on your own and talk to the people there who obviously do want to go skydiving :). Im having some problems myself lately, and im no way qualified to give advice, but the above is what i truly believe. Unfortunately cannot help with my relationship related issues. So my hunt for help continues. I am a loner .I never talk to people unless am spoken to I form a habit of staying at home always because I have social anxiety .it really piss me off .people always complain saying that I don’t talk,am always quiet and this makes me feel rejected . Thanks for sharing a very encouraging post. Having a positive perspective in life, allowing change to dominate you, can make a big difference in life. Interesting article Sean as of lately I’ve been trying new things like you say here and if I’m honest I feel a lot better. Maybe it doesn’t get rid of all my depression but this helps A LOT. Great article as always. this article sounds like it was written about me. I stay in my room all day watching tv (but I don’t eat junk food). I barely eat anything at all. only go out when I absolutely have to. I get anxiety when I have to go out. I feel totally worthless. I feel bad about it because I should be out taking care of my husband and my daughter (she’s 26 and still living at home). But it’s hard for me to leave my bedroom. maybe one day i’ll get over this. Another reason some people stay in their house, apartment, or place of living very often is they can’t drive and have bad access to transportation. Maybe that person can’t walk or move well so they only go places when they have to. Maybe that person is handicapped mentally so staying at home puts them more at ease. Normal people who can’t drive have it much harder to leave the home. You either have to take the bus, walk, or a taxi ride somewhere. It takes too much time or costs too much. Its not easy to leave their home so they are at home more. Besides what I mentioned I agree with the article. People stay at home cause they are in their own space and feel comfortable. They choose to avoid the world or interact with people. I really don’t care if people choose to live like that. Its there own choice. At least these people aren’t bothering others or doing something bad. Thank you. This article… helped 🙂 Well I’m slowly just realizing that I don’t love myself almost at all. Took me 2 years of being a recluse to figure that out. It was definitely my anxiety disorder. I’ve made an effort to change and I DO change but that doesn’t last long. I don’t know why I just end up like meh lazing aroung watching tv was more fun. In other words, I don’t know how to motivate myself again after my first step. I’d love to hear your insight. Hi Sean, thanks for the nice article, I thought at fisrt that ideas depressed, maybe I am i don’t know, I mean I do take showers and pay some attention to how I look but then again do I do this because I have to? I go to work 5 days a week so I can’t afford stinking i guess. I do on the other hand spend a lot of time at home! sometimes I wouldn’t go out for weeks, if rather watch series and movies and it’s becoming like an addiction. I even feel upset if someone wants to come over and see me coz I’d be like well here’s an hour spent ima good movie that I’m gonna have to waste on someone!! I know it sounds horrible but this is how I feel! for awhile now actually. is it depression? or is it mere resentment of people? or of myself? this is starting to worry me coz I’m shutting people off and im losing more and more friends or acquaintances. and what’s worrying is that a part of me thinks tahys it’s no waste at all and it’s just more time to watch movies or read a book!! Doesn’t sound like social anxiety to me. At least I didn’t see it anywhere in there or a hint of it. It’s more like depression. When I’m down I become reclusive and alone time is regarded as better than time with other humans. You may never ever see this, But honestly ive never had anyone sum up my feelings word by word like you have. My Bi-polar, Chronic Anxiety with Major depression really fucks things up for me. Even with treatment im up and down, Once im not Manic anymore it gets harder for me to relate with people and people almost seem to shy away from me. I dont want to do anything alone either. So I guess Going to the Gym and doing Small Fun activities i dont feel bad about doing alone is a start, I like to knit and use adult coloring books, and I also enjoy Tv and Computer but I know that is unhealthy, i like to read 🙂 In general alot of my favorite hobbies dont require for me to ever leave my house perhaps this is becuase i dont try much outside the house but it makes it harder to find friends i relate with, Alot of people want to go out all the time, or always go out somewhere and dont ever want just rest at my house with me, So its hard. I want friendships and i cant find a balence or find a way to Value myself. I agree with you so hard. Therapy and Meds and DBT all say the same things but doing them consistently for the rest of my life feels so impossible. Its so much time and effort and it makes me even more depressed when i cant reach those goals weather my job or school be a time barrier where by the end of the day i feel like its not worth giving myself anything but rest so i can function the next day.